Want to knock their socks off? I hope the answer was a big fat YES, because that’s what this blog is all about. Specifically, how you can knock their socks off in a “general meeting”. A “general meeting” (often just referred to as a “general”), is sort of meet and greet… Just you and a Casting Director (usually). Chit-chatting. I made this video for you because when I was Vice President of Casting at HBO, we did generals almost daily. We sat down and “chit-chatted” with actors like you, with absolutely no specific project in mind. Just to get to know them. So, after 14 years, you can imagine how many generals I had with actors…Wowza! Because if you haven’t had a general meeting with a Casting Director yet, you will at some point. And when you do, you'll want these 3 tips so you know what to do, what to say and how to get the most out of this fantastic opportunity you have at your fingertips. 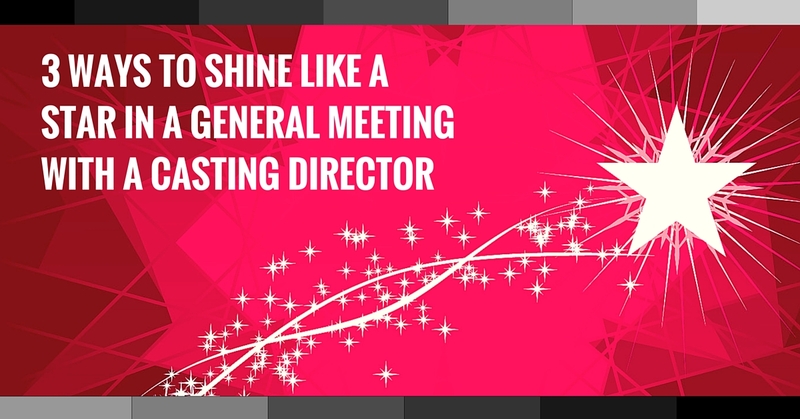 How Do I Shine In My General Meeting With A Casting Director? Did those 3 tips for your Casting Director general give you some perspective? Now that you know what’s important, what to do and what NOT to do in a general with a Casting Director, make sure you bookmark this page so you can come back and review it before your next (or first) general. …A relationship from which you can enjoy a bountiful harvest again and again, over the scope of your acting career….IF you do it right. And great news for you…by watching this video and reading this blog, you just started off right. If you enjoyed this acting tip video on how to stand out in your general meeting with a Casting Director, retweet and comment please. I never had a general meeting with a casting director before. Your video has helped me to know what to do when I do get one. The only time I have had a meeting with a casting director is at the casting. So I should talk to the like they are my friend basically. Why do some of them insist on talking on the phone first? Thank you Amy Jo Berman~ I, when permitted to be myself, always bring a small gesture-gift when meeting with old, and new, business and personal contacts. Frequently, the gift is box of Reed’s ginger candy…or some soda, as my husband is on the board of directors and we have products to share. I do not intend it as a bribe, yet to provide sweetness and, perhaps, if warranted, a mnemonic device for future casting. Will you tell me if this instinct to share is considered inappropriate in the entertainment business? Have a wonderful day. Thanks for your thoughts! Great advice! Always good to hear what you have to say for us to put into practice! Best! This was great! Now I won’t be nervous not knowing what to expect. Being myself and talking to people comes naturally to me. That’s when I shine according to people I know. Thank you so much for the tip! Have not had a general yet, per se, but this tip is a good one. When I do I will see your smiling face telling me to “Just Be Yourself” & relax!!! Wow first time I hear of this. In Vancouver unheard of but now that I am heading to LA.. I am all ready thanks to your TIP! I just left a general with the SVP of casting for WB television. I watched your video to prepare and it helped me immensely. I had the “coffee with a friend” mentality and it just went swimmingly. We ended up having a lovely chat that I’d want to have with just about anyone. Thanks for your wisdom! I wish all casting directors would have general meetings instead of many of them only being accessible via workshops and agents. That was a great video and good advice! I have a meeting with a casting director tomorrow! Thanks for un-nerving me. I used to work at Pearl Studios in NYC, Amy. I remember seeing you there. You were incredibly nice and professional. Thanks again.